Funny how is a common way of opening a sentence. Those two words also feature in the titles of five UK hit singles – most of them minor, Funny How Love Can Be (Ivy League), Funny How Time Slips Away (Dorothy Moore), Funny How Love Is (Fine Young Cannibals), Funny How Time Flies (When You’re Having Fun) (Janet Jackson) and, bizarrely, just Funny How for Airhead in 1991. An odd title on its own, so I looked into it further. 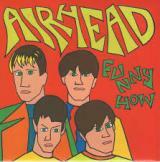 Airhead were a four-piece from Maidstone in Kent and were originally called The Apples when they got their first recording contract with Korova, a subsidiary of WEA, in 1990. They got the contract of the strength of one demo song with the wonderfully titled The Apples go to Pip City via Victoria and All for Under a Fiver. Soon after they were signed they decided to change their name to Jefferson Airhead, but following a swift, but polite, request from Jefferson Airplane they dropped the Jefferson and were to be known as just Airhead. The band comprised guitar and vocalist Michael Wallis, bass player Ben Kesteven, Steve Marshall on keys and Sam Kesteven on drums and had a sound that can best be described as a cross between the psychedelia of The Beatles or The Byrds and the indie sound of bands like the Inspiral Carpets, Jesus Jones and the Charlatans. Once they settled in with their record label and name change they began working on their debut album, Boing and the label paired them with former Bow Wow Wow bass player Leigh Gorman who had turned his hand to production. So, the title, Funny How, was actually shortened from the rather lengthy It’s Funny How the Girls you Fall in Love with Never Fancy You, Funny how the Ones you Don’t, Do which is probably a tad long but was more likely to be remembered, but the song was given heavy radio play by Radio One and they were even offered an evening session by Mark Goodier. The song was given an extra boost when the BBC chose it as the introductory music on Match of the Day, but despite the support, the single stalled at number 57. The lyrics are typical of a relationship that seems to be running one way although Wallis, who wrote the song, has never revealed if it was written from a personal level. You can’t help thinking it’s real and you have to feel sad when you hear the last lines; Don’t pass me up again, cos I’m not that tough, haven’t you seen me suffer enough? That Christmas they released the follow-up, the catchy Counting Sheep which fared better by making it to number 35. This was their commercial peak because the follow-up to that, Right Now, stiffed at number 50 and then the band split up because Michael became disillusioned with the record company and wanted to launch a solo career. He took Sam with him and recruited Roger Wells as his new bass player and began recording an album at Falconer Studios in London. Their debut released was an EP called That’s Enough which showcased a different side of Wallis’ songwriting. They worked hard with live appearances to give it the boost, but without a record deal and thus no promotion their efforts were in vain. The album Boing only reached number 29 and in June 2007 the music journalist Joel McIver launched a campaign to get the album re-issued. The band’s website was inundated with comments and requests for a reunion. Wallis replied by saying, “We’ve all been shocked to see how many people still remember the band and it’s great to hear how much the album was enjoyed.” Ben added, “It’s not a matter of motivation to do some gigs, it’s more a problem of logistics. We all live in different areas now, have jobs etc and I’ve got two young kids so getting together for rehearsals let alone gigs would take a lot of organising. It’s certainly not something I’d rule out and it’d probably be good fun etc but I really can’t speak for the other guys.